Lamont Cranston investigates crime in classic pulp thrillers by Walter. B. Gibson and Bruce Elliott writing as "Maxwell Grant." First, one by one, prominent citizens fall victim to "Fingers of Death" and only The Shadow can uncover the murderous mastermind behind the serial killings! Then, mysterious writing on a wall, a toy boat, and a kite set Lamont Cranston on the trail of the Hollywood extortionist behind "The Blackest Mail." BONUS: A lost Shadow radio adventure by Walter Gibson! 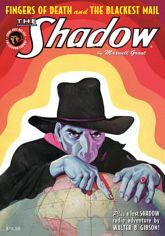 This instant collector's item showcases the original color pulp covers, classic interior illustrations by Tom Lovell and Newt Alfred, with historical commentary by Will Murray. Softcover. 128 Pages. Black & White. 7" x 10"